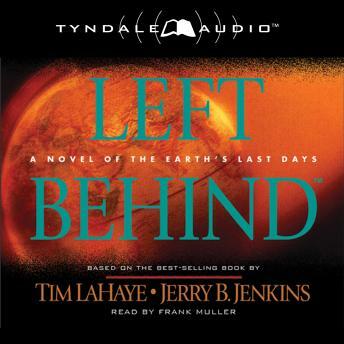 Only one series will take you to the end of the world as you explore eternal truth: the best-selling Left Behind series by Tim LaHaye and Jerry B. Jenkins. Now the entire series is available in an audio CD format. Each abridged CD is read by Frank Muller. When the trumpet sounds, where will you be? Passengers in an airborne Boeing 747 find out in this riveting novel by renowned Christian speaker Tim LaHaye and master storyteller Jerry Jenkins. Without any warning, passengers mysteriously disappear from their seats. Terror and chaos slowly spread not only through the plane but also worldwide as unusual events continue to unfold. For those who have been left behind, the apocalypse has just begun. This fictional account of life after the Rapture delivers an urgent call to today's readers to prepare their own hearts and minister to others. Extremely compelling, well written. Love the series.